Instant Video: From now onwards, you can watch and share the video feeds on messenger. 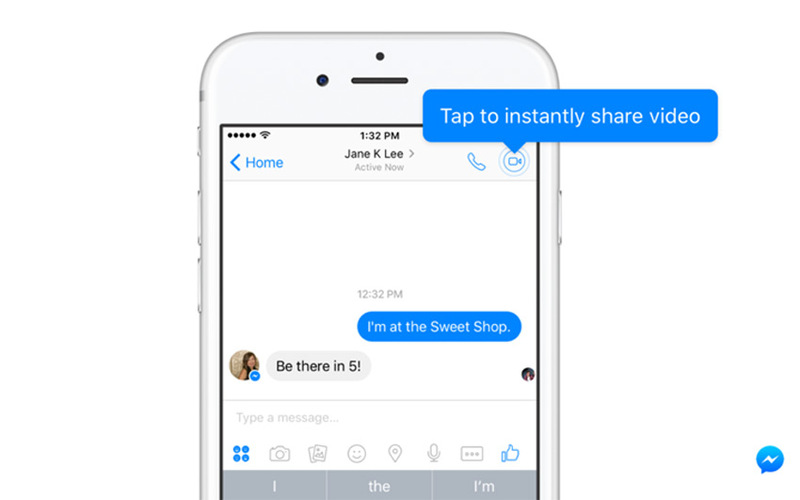 The Facebook Messenger adds this new feature to videos with your friends while chatting. Videos mean you can now share your Live video with your friends and family simultaneously on chatting. This Instant Video update of Messenger looks like the Snapchat video calls. The users (you and your friend) can make a video chat when both of them on Conversation window. The Video button will appear on the conversation window. If both of them need a Live chat mean, then it will help you to share your feelings. It is another alternative to express our feelings with our loved one. Lastly, we used stickers and emojis for our real feelings. Now, it becomes more reality. Just Tap the instant Share Video Button at the Top right corner of your window like an above image. The Live video will pop-up in a small movable window. If you need the big screen, then you can change it as a full video. Also, you can chat simultaneously like a Skype Video chat. The following information is given by the Facebook Messenger feed Today on September 01, 2016. Today we’re excited to announce Instant Video, which allows you to seamlessly add live video when you and a friend are both active in a conversation. Instant Video is great for sharing quick everyday moments or making your conversations richer by seeing each other face to face. Sometimes you just want to ask a friend’s opinion on a pair of shoes you want to buy, weigh in on what ice cream flavor they should bring home, or see their reaction to your witty message, when you’re in a place where you can’t talk live (like a meeting – don’t tell anyone!) ? Instant Video allows you to share regular parts of everyday life with the people you care about most. Instant Video makes live video with your friends as easy as sending a sticker or emoji. Here’s how it works: when you and a friend are viewing your conversation at the same time, the video button in the navigation bar will pulse. Tap the pulsing button to instantly start the video stream and share your experiences in real time. Your video will be viewable over the text conversation. Your friend can watch the the live video or choose to share a video back. We hope you enjoy this Instant Video feature – tell us what you will use it for! It is one of the good updates from Facebook-owned Messenger. It will help a lot for the online Friends and also for the Business people.